The Paul Feig remake—reboot?—of the 1984 hit is a childish romp through gadgets and slime, and a pretty good one at that. It has been a bit perplexing to watch and endure the gargantuan amount of hype surrounding the second go-around for Ghostbusters, most of it negative, some it truly vitriol. It was all for naught. Ghostbusters is mostly funny, not too edgy, and always entertaining. This is a pretty good description of the original, and perhaps that’s all some fans had wanted. Dr. Erin Gilbert (Kristen Wiig) plays a brilliant particle physicist hoping for tenure at a prestigious university. Her hopes are dashed, however, when she discovers that her old lab partner, Dr. Abby Yates (Melissa McCarthy), is selling copies online of a dubious book on the paranormal they co-wrote years ago. 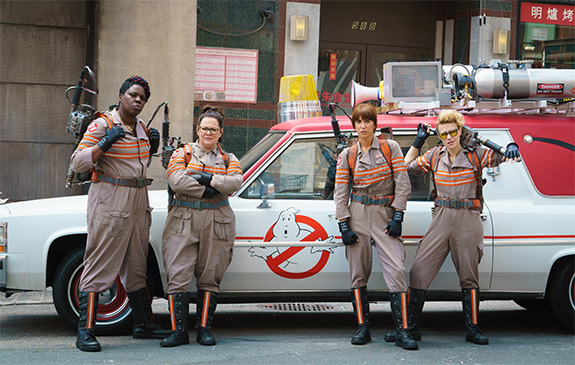 Soon jobless, she joins Abby, engineer/quartermaster Jillian Holtzmann (Kate McKinnon), and street-wise Subway worker Patty (Leslie Jones) on a mission to discover why ghosts are suddenly popping up all over New York City. For such a silly, slender premise, this movie generated some serious internet chatter. (Perhaps that really shouldn’t be surprising.) As of this writing, its trailer is the tenth most disliked video on YouTube, and the only movie trailer in the Top 30. Some criticism has focused on feminism and gender-bending, reacting to the casting of all females in previously male roles. This response is understandable in the context of a society in which gender theory has gone completely and wildly awry. Yet, in this instance, there is nothing about the characters that demands a specific gender and there are no serious romantic themes or storylines. Despite the cast, there was a significant lack of gender-related humor—an oddity for a Paul Feig film. Another possibility was burnout over an endless amount of sequels, spin-offs, remakes, and reboots. This is a better criticism as Hollywood has been franchise crazy as of late, but even the most original films depend on established storytelling patterns. The most likely culprit is nostalgia for the original 1984 Ghostbusters movie. Often, a series is rebooted either because of poor reception for the original or because a significant length of time has transpired since the first outing. Yet Ghostbusters was a beloved classic that premiered only thirty years ago. It was nominated for two Oscars, had rave reviews, topped the box office for five consecutive weeks, and even was rated the 28th funniest movie of all time by the American Film Institute. As a Millennial, I have a healthy sense of distance that may put this criticism into better perspective. Both films rely on the same sense of humor, created by SNL alums as an extended skit that found comedy in a dumb idea. Both of these films also succeed under the same parameters, and while they share a basic Universe, the jokes are completely different. If one needs any more validation, the new Ghostbusters contains no less than five cameos from original cast members. Sadly, the late Harold Ramis and Rick Moranis are missing. As a stand-alone film, Ghostbusters is Paul Feig-lite. It has all his usual trademarks—Kristin Wigg, Melissa McCarthy, scatological humor—but is his first PG-13 offering. It’s funny but restrained. Especially good are McKinnon as a nerdy Gilligan type and Chris Hemsworth as Kevin, the objective beefcake yet incredibly stupid receptionist. Who knew Thor had such good comedy chops! As a theologian, I suppose I should say something about the nature of ghosts, evil, and the paranormal. But let’s face it: Ghostbusters really doesn’t care. It’s a childish romp through gadgets and slime, and a pretty good one at that. In the end all the worry was much ado about nothing, and if you are a scholar of Shakespeare, you’ll find that joke really funny. Caitlyn Mayfair: I think female cardinals is the greatest idea ever. It would finally give women some power in the Church. Caitlyn Mayfair on Should the Church have women cardinals?